Junko Kazukawa has always been a woman who is unafraid to make bold moves in life. Growing up in Japan, she knew that young women were expected to follow a traditional path: Go to college, take a job in an office for a few years and then get married and start a family. While that path was fine for most, it was unacceptable to Junko. She explains, “I wanted to do something that would change my life. I had to be by myself and I did not want anyone to help me.” Realizing that the traditional path was not for her, Junko set into motion a plan that would ultimately take her far from home, sending her on a life-long journey that would not have been possible if she had stayed in Japan. Over the years, Junko’s inherent courage has led her to a life of taking on challenges that others have often advised against. In 2015, the brave 52-year-old two-time cancer survivor tackled something that no one else had ever done, completing the Grand Slam of Ultrarunning and the Leadwoman series in the same calendar year. Though Junko has become a tough and dedicated endurance competitor, she was not a naturally athletic child. In Japan, children are graded numerically on a scale of 1 to 5, with one being the lowest and five being the highest. Junko was a good student, but she never enjoyed physical education class. She routinely ended up receiving a “2” in PE. One year, she actually got a “1” in the class. While Junko was never pleased with receiving a “2”, seeing the “1” on her report card sent her over the edge. She recalls, “I had no idea why I got a ‘1’. Did the teacher not like me?” Rather than let the perceived slap in the face get her down, Junko set out to prove herself to her PE teacher. She began practicing with the basketball team. Through hard work and an intense desire to succeed, Junko secured a spot on the basketball team. In time, she earned a “3” and the respect of her teacher. This grit and determination has become a constant theme in Junko’s life. As she grew up, she saw very clearly what her future would be like if she followed the traditional path in her home country of Japan. While it was fine for most people, she could not bear the thought of following the road from office worker to wife to mother. Junko set a path in motion created a plan that would allow her to do something radically different from her peers. She knew she wanted to come to the United States to study, so Junko started her journey by spending two years studying the English Language. During that time, she spent a month with a host family in California. When she returned to Japan, she set her sights on returning to the US to live and study in Colorado. Leaving behind her parents, her older sister and younger brother in Japan, Junko moved to Colorado at the age of 24. The girl who once received the lowest possible grade in PE class opted to study exercise science, eventually obtaining a Master’s Degree in the field. After completing an internship in cardiac rehab, she worked in a variety of settings, from a physical therapy clinic to corporate wellness. She is currently the Group Fitness Coordinator at the Colorado Athletic Club, Tabor Center. Throughout her career, Junko taught classes and worked as a personal trainer. She ran 5ks and 10ks for fun over the years, with the Bolder Boulder 10k being a long-time favorite. In the early 2000s, a friend’s qualification for the Boston Marathon planted in a seed in Junko’s mind. Though she had no idea how difficult running a marathon is, Junko chose the 2002 Tucson Marathon as her goal race. She completed the race in 3:27:08, qualifying for Boston on her first try. Thus began Junko’s love affair with distance running. She went on to run multiple marathons over the following years. A typical year of running consisted of several shorter races along with five or six marathon distance races. The Boston and New York City Marathons were consistent favorites for Junko. In 2005, life took an unexpected turn when Junko found a lump in her left breast. Testing revealed that her lump was breast cancer. Junko was shocked by the diagnosis. She had taken excellent care of herself and she could not understand how she, of all people, could have cancer. Fortunately, because her cancer had been discovered early, Junko was able to have a lumpectomy followed by radiation. Though hearing that she had cancer was frightening, Junko knew that she was exceptionally lucky because her cancer was found early before it had spread. Junko went on with her life following her cancer scare. She continued in her career. She ran more races. Junko’s boyfriend was a professional mountain biker, and she began dabbling in the sport, too. Junko never considered mountain biking to be her athletic strength. However, she had never ever been one to shy away from activities that scared her. She rode in some 50 and 100 mile mountain bike races. It was Junko’s exposure to the Leadville 100 mountain bike race that ultimately got her thinking about running the Leadville 100 mile footrace. It was this second time around of facing her own mortality that pushed Junko to finally sign up for the Leadville 100. The realization that she might not have an infinite amount of time prompted Junko to take on what she considered the ultimate challenge. Because Junko wanted to make her running about more than just herself, she ran Leadville as a fundraiser for the Susan B. Komen foundation. She decided to put it out to the world that she was going to finish Leadville as a way to motivate herself to train and put pressure on herself to finish. Because the Leadville 100 is close to the major Colorado cities that run along the Front Range, it has a “hometown” feel for many Coloradans. Junko fell in love with this hometown feel. She returned to the run and finished the race again in 2011, 2012 and 2013. In that time, she also decided to take a shot at finishing the 100 mile mountain bike race, as well. Her first couple of times out, Junko missed cut-offs and had the dreaded “Did Not Finish” (DNF) in the 100 mile bike ride. But because she seems to work well under pressure, Junko decided to sign up for the Leadwoman series in 2014. This series consists of the Leadville marathon, the 50 mile mountain bike ride, the 50 mile “Silver Rush” run, the 100 mile mountain bike ride, the 10k trail run, and finally, the 100 mile endurance run. Since Junko had DNF’d in the 100 mile bike already two times, she felt the enormity of what she had taken on. “I needed to make the cut-offs,” she explains. “It was a big, big challenge for me.” Fortunately, the third time was the charm for Junko. She completed the series, finishing third among the women. Simply completing the Leadman/Leadwoman series is a tremendous accomplishment. The majority of athletes who are brave enough to sign up for the series fail to complete all of the races. Junko had just accomplished something monumental by any standards, and yet it was not quite enough. She knew that she would return for the 2015 version of the Leadville mountain bike race. However, hitting it big in a lottery would now prove to be a life-altering experience for her. Junko had long set her sights on running the Grand Slam of Ultrarunning, which consists of four 100 mile races (Western States, Vermont, Leadville, and Wasatch) run in a 4 month span. Just to get into the Grand Slam is an exceptionally difficult task in this day and age. Runners face long odds of getting into the first race in the series, Western States. Entry to this race is via lottery and first-timers have little chance of being accepted. Again, the third time was a charm for Junko. After being rejected in 2013 and 2014, she was accepted for the 2015 Western States. Immediately she realized that she had better put in for the Grand Slam, because she knew she might not get back into Western States at a later time. She applied to, and was accepted into Vermont, Leadville and Wasatch. While running the Grand Slam is an extremely daunting challenge for most endurance athletes, Junko wanted more. She couldn’t help but think that now that she was committed to the Leadville 100 bike and foot faces, maybe she could somehow squeeze in the Leadwoman series and the Grand Slam in the same year. Junko looked at her calendar, and though she knew it would be difficult, she thought that she just might be able to pull it off. Junko spent the months leading up to the Grand Slam and the Leadwoman training hard for her events. Though she runs a lot, surprisingly a lot of Junko’s training is in the form of cross-training. She teaches a number of fitness classes each week, including spinning and plyometrics training. She cycles quite a bit and goes for some short runs during the week, if she has time. However, the bulk of her training for 100 mile runs comes in the form of back-to-back long runs on the weekends. Junko typically puts in 45-50 miles in any given weekend, divided up into two runs. She believes that all of her cross-training keeps her strong, healthy and free from injuries that plague higher mileage runners. Junko’s challenge began in June, 2015, with the Leadville Marathon. “I was nervous,” Junko recalls, “But I just had to trust myself that I could do it.” She kicked off her summer-long odyssey by completing the high-altitude marathon in 5 hours and 45 minutes. One week later, she would travel to California to toe the line at the Western States 100. Western States is one of the oldest 100 mile endurance runs in the United States. Junko was excited to run with some of the best ultrarunners in the world at this prestigious event. She knew the course was going to be mountainous, but thought that the net downhill would suit her style of running. “Western States lived up to its hype,” Junko says. “Right from the start, it was so fun. There were lots of ups and downs. I felt so strong in the first bit of climbing. However, I set a goal time that was too fast. In first big descent, I could really feel my quads.” At mile 40, Junko developed the worst blisters of her life. “Half of the backside of both feet was gone. I should have changed my shoes, but just didn’t. Every step was so painful. 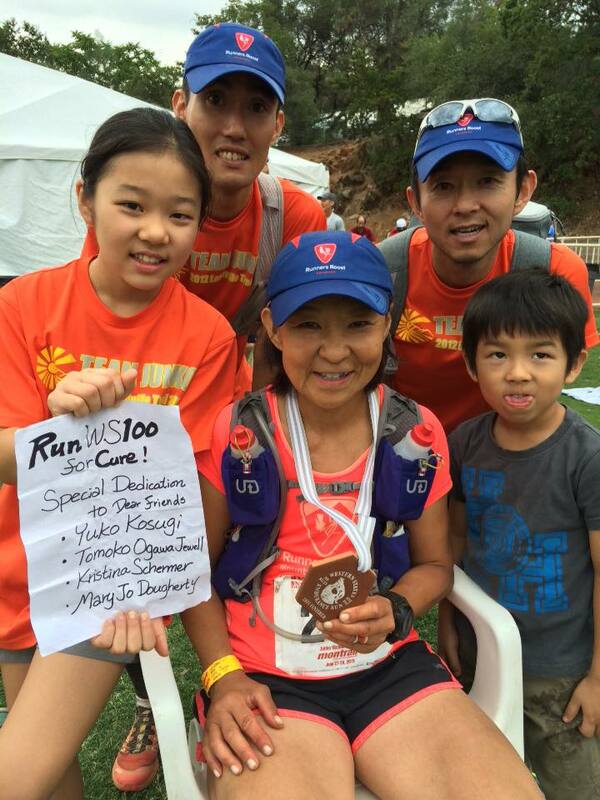 I slowed down quite a bit and did not make anywhere near my goal time.” Still, despite the difficulties she encountered, Junko finished the Western States 100 in 27:32:52, well below the cut-off time of 30 hours. Most people would have taken weeks to recover from such a challenging race, but two weeks later, Junko completed the next phase of her quest to be a Leadwoman: the Leadville 50 mile mountain bike ride. She was nervous going into the event, because biking is not her strong suit, but she did well and finished without incident. The second race in the grand slam, the Vermont 100, is written off by some as the easiest of the four 100s in the slam, because it lacks the high altitude and overall climbing of the other three western races. However, Vermont’s constant undulating course is underestimated by many runners. Couple the relentless rolling hills with East Coast humidity and the race has been known to present real challenges for many runners. Junko had expected to run a fast time in Vermont, but she faced many obstacles in Vermont and it turned out to be one of the most difficult races of her career. About a year after she completed chemotherapy, Junko began experiencing extreme spikes in her heart rate. She was diagnosed with Supraventricular Tachycardia. At times, Junko’s heart rate can spike above 200 beats per minute. For the first seven miles of the Vermont 100, Junko felt great. Then, suddenly, her heart rate climbed dangerously high. She was suddenly reduced to walking. Though she never once considered quitting the race, she wondered if she would have to walk 93 miles of the course. She recalls, “The heat and humidity made it really hard. I walked every little hill. It was a really painful race. After about 12 hours, my heart rate came down, but then I started dry heaving. It was horrible.” Making things even tougher for Junko, she had opted to forgo having a crew or pacers with her for Vermont. As a solo runner, she had to traverse all 100 miles without any outside assistance. Still, Junko was persistent. With about six miles left to go, she made the decision that she was going to run to the finish line. Junko pushed herself as hard as she could over those final miles and finished the race in 27:30:57. Three weeks later, Junko faced back-to-back races in Leadville. The Leadville 100 mile mountain bike race was held on Saturday and the Leadville 10k was on Sunday. The Leadville 100 mile mountain bike race had long been a big obstacle for Junko. She timed out of the event twice, before finally finishing it in 2014. If she failed to complete it in 2015, her dreams of being a Leadwoman would be over. Though she had minor mechanical issues early in the race, she went on to finish the race ten minutes faster than she had previously. This was a big confidence-boosting moment for Junko going into the following weekend’s Leadville 100 mile endurance run. Finally, on August 22nd, 2015, Junko lined up to run the Leadville 100 mile endurance run. Even though she had run this particular 100 mile race several times before, she knew this was a critical event. It was the final race in the Leadwoman series and it was her third 100 out of the Grand Slam. This would be her fifth time running the Leadville 100, but even though she was familiar with the course, she knew she could not underestimate its difficulty. The high-altitude race has brought many seasoned athletes to their knees. Fortunately, Junko would not be facing the race on her own. As part of the Runner’s Roost Mountain Ultra Trail race team, she would be surrounded by many friendly and familiar faces. With so many team members in Leadville for race weekend, she had plenty of crew and pacing support for this classic ultrarunning event. What made Leadville extra-special for Junko in 2015 was that two of the women she had been racing for all year were able to be with her. Junko’s friend Kristina, who was battling cancer, even paced her through the final section to the finish line. Finishing in 27 hours and 40 minutes, Junko describes the moment as “Emotionally very big.” She had been carrying her three friends names with her during each race, but to have them present for Leadville made the moment unforgettable. Junko got to rest for four weeks between Leadville and Wasatch. She describes the final race of the Grand Slam as very difficult. She explains, “The elevation of Wasatch is not as high as it is at Leadville, but there is lots of climbing.” While the other three 100 mile races all have a cut-off of 30 hours, Wasatch allows runners 36 hours to complete the notoriously difficult course. Fortunately, Junko had two crew members/pacers who were very experienced. Long-time friends, she trusted them completely. She explains, “I was confident that these two knew what to do and knew me. I thought, ‘I am just going to go ahead and run.’” In addition to her two pacers, one of the women she had been running to honor, Mary Jo, was able to come out and help crew. Having Mary Jo with her added to the emotional experience of race weekend. Though the course was incredibly tough and challenging, the beauty made the experience a joy. “You run on a ridge a lot, so you we could see Park City. It was beautiful. There was a lot of steep climbing. The temperatures dropped close to zero at night and it was super warm in the middle of the day. I needed a lot of preparation to handle the big temperature changes.” In the end, 52-year-old Junko Kazukawa finished Wasatch in 30 hours and 45 minutes, becoming the first person to complete the Grand Slam and the Leadwoman series in the same season. Previous ArticleSleep. Who Needs It?